If you are a startup, earning customer trust is so important to get those first few clients and get things rolling. However, even if you are a well established business, continuously maintaining customer trust and meeting customer expectations is as important for keeping existing relationships as for making new clients. Adding a live chat tool to your website is one simple and efficient way to build credibility with your customers. There are several aspects of how you manage live support on your website, which signal the customer right away how credible your company is and whether you are worth having business with. If you want to give the right impression and look credible in the customers’ eyes, watch out for the following things. Excuse me, but if you have a live chat icon on your website that says “24/7 support”, but whenever customers are trying to reach you, all they see is an “offline” or “not available” message, that ain’t gonna work. The trust is broken from the start. The customer concludes that you don’t practice what you preach, so how are they going to believe whatever you are offering them to purchase from your website. This is the number one fault that many companies make when they start utilizing live chat, so make sure to avoid that. If you are a small business and can’t offer live support 24/7, that’s fine. Just be transparent about it and set the customer expectations right. The speed of response is a crucial factor in showing your company’s credibility. I’ve seen many chat lines where it was popping in my eye that an agent is at a standby and ready to answer my question. To my disappointment, when I actually accepted that offer, I was presented with many automated responses telling me that I could browse a knowledge base, answer some questionnaires or needed to wait for an answer. I had no way of figuring out whether my call would be answered at all or not. Sometimes 10 to 15 minutes could pass before someone had answered or I had given up on waiting. Research proves that customer expectations for the speed of response are very high: 60% of customers will abandon a call after just one minute of waiting on hold. Consequently, taking care to respond to all live chat inquiries within one minute is an immune booster to your company’s reputation. Recently I had to deal with one staffing company. I will save the advertising, but they had a really nice website and were priding themselves in working with many big clients. They indeed seemed to have a quite advanced candidate assessment tools. Everything seemed just great. But when it came to speaking with their representative on the phone, I was very surprised. I could barely distinguish what they were saying for two reasons. It seemed like the call was being made from a north pole, there was a terrible connection from that location. And the second reason, the person had such a strong accent that it was almost impossible to decipher their words. Additionally, the person was just clearly reading a script and was absolutely not interested in what I was saying, probably because they also couldn’t clearly hear and understand me. Now, I am not against outsourced contact centers. I had many pleasant experiences and I consider it a completely normal practice. But I couldn’t help feeling disappointment and mistrust. If their support is like this, probably all those great things written on the website is just a bait to get you in, but that’s what you will get in the end. 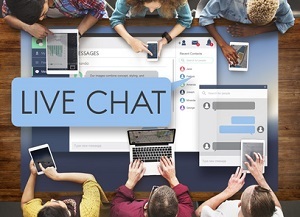 If you are at a stage where you are looking for ways to earn greater trust with customers and build credibility, consider adding live chat to your website. Live chat is a simple in implementation, yet a powerful tool to shape and monitor how your clients perceive your brand. It helps to maintain your company’s reputation and create long-term relationships with your customers. However, remember, that a powerful tool can also work against you. So watch out how you manage online support and avoid the pitfalls that we discussed today. If you want to give live chat a try, Provide Support offer a 10-day free fully functional trial that can be installed on your website in just a few minutes. Sign up for the trial today and start earning new loyal customers. This entry was posted in Articles, Tips and Tricks and tagged boosting credibility with live chat, building credibility with live chat, online support determines website credibility, online support helps credibility. Bookmark the permalink. Hello Murali. You may contact us in chat and our team will guide you how to start using the tool. Thank you. Thank you for sharing your experience, Carolina. It seems that it matches mine on a lot of occasions. I fully agree. If I realize that the company delays in its support be it online or offline I simply change company. And that’s why I try to serve my clients as fast as possible. Great approach to serving your clients, Jenny! Thumbs up )). Great tips on how to use online support, I applied one of these tips and had an amazing result, thanks for the wonderful article! Thank you for sharing your experience, Marcelo! I’m delighted to hear that the information we shared was practically useful to you and your company. Yes it was very useful, I will be waiting for more news! I agree that the approach is excellent, I will apply. Very good! Thank you for reading the post, Vinicius. I’m glad you found it useful. I will send the article to them as soon as I solve my problem. Thanks for sharing your experience, Rhonda. I agree that the approach is excellent, I will apply. Good job! Thank you for your appreciation, Mara. This article really talks about important points in what is crucial to good care! Thaks for the article. Very good! Thank you for your feedback, Mariana. Thank you for sharing your opinion, Regina. I agree with you that support needs to be of good quality, otherwise it’s not worth the effort. In all areas that we act we have to pass credibility. Very good Congratulations!